Want to give your chicken barbecue a new twist? Why not try this citrus chicken barbecue? This chicken barbecue dish has orange juice and orange zest to give your chicken barbecue with an appetizing citrus flavor. For those not familiar how to get the orange zest, just grate the orange skin on a fine grater, collect the grated orange skin and put it in the marinade. Don’t include the white part or inner layer of the orange skin. 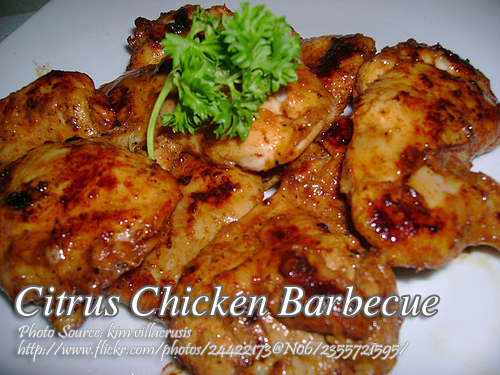 To cook citrus chicken barbecue; Clean and rinse whole chicken and chop to serving pieces. Prick the skin and meat with toothpick or barbecue sticks so that the marinade will penetrate inside. Combine all marinade ingredients, Worcestershire sauce, orange juice, zest of orange, soy sauce, sugar, ketchup, melted butter, salt and pepper. Add chicken and marinate for at least 2 hours or overnight inside the refrigerator. Fire up the charcoal and reserve the marinade for basting the chicken. Skewer the chicken alternately with the orange slices. Grill the chicken and baste with the marinade occasionally until cooked. Clean and rinse whole chicken and chop to serving pieces. Prick the skin and meat with toothpick or barbecue sticks so that the marinade will penetrate inside. Combine all marinade ingredients, Worcestershire sauce, orange juice, zest of orange, soy sauce, sugar, ketchup, melted butter, salt and pepper. Add chicken and marinate for at least 2 hours or overnight inside the refrigerator. Fire up the charcoal and reserve the marinade for basting the chicken. Skewer the chicken alternately with the orange slices. Grill the chicken and baste with the marinade occasionally until cooked. In case you want to bake the chicken, preheat oven to 350 °F. Arrange chicken on a baking dish and pour the marinade over. To make the dipping sauce: simply mix 2 teaspoons of Worcestershire sauce with half a cup of tomato or banana ketchup.